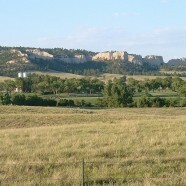 Fort Robinson is a former U.S. Army fort and a present-day state park. Located in the Pine Ridge region of northwest Nebraska, it is 2 miles west of Crawford on U.S. Route 20. During the summer there are many daily activities such as; jeep rides, horseback rides, horse-drawn tours, breakfast cookout, buffalo stew cookout, steak cookout, among other activities. It is also the location of the 1879 Cheyenne Outbreak and death of famed Sioux County Chief Crazy Horse and the location of the Red Cloud Indian Agency.